This is a lesson plan about the Fibonacci sequence and the Golden ratio, suitable for both middle school (first part) and high school math students. You add any two consecutive numbers from the sequence to get the next one. For example, 0 + 1 = 1. Then, 1 + 1 = 2. Then, 1 + 2 = 3. And so on. This sequence is called the Fibonacci sequence or the Fibonacci numbers. And it isn't just any old sequence: it has some amazing properties, plus it's found in nature in many places. A tiling that uses squares whose side lengths are successive Fibonacci numbers. Ask students to continue it! Or, you can draw a spiral like the one below. In fact, the spiral uses the same tiling! 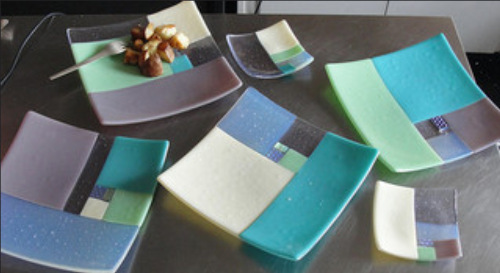 For example, the plate in the middle could be 21 cm by 21 cm (turquoise area; we don't see that square completely), the white square in it could be 13 cm × 13 cm, the sky blue square could be 8 cm × 8 cm, the black could be 5 cm × 5 cm, and so on. 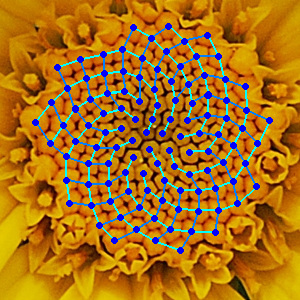 Seed heads and flower heads often use arrangements that are based on Fibonacci numbers, because it turns out that is the most efficient way of packing seeds or florets in a round arrangement, yet allowing more of the seeds/florets to GROW from the middle. Also, did you know plant leaves are arranged around the plant stem based on Fibonacci numbers? (See one of the above links.) Similarly, tree branches rotate around the trunk in a pattern based on Fibonacci numbers. This makes the new leaves not to obscure any of the leaves down below from sunlight. In the links below you can learn more and see many pictures about Fibonacci numbers in the nature. The website also includes activities for students (in the boxes titled "Things to do"). What is number Phi and how does it tie in with Fibonacci numbers? If you continue writing more of those ratios and calculate their decimal expansions, they will keep getting closer and closer to a certain number... though they never reach it totally! The number that the ratios keep approaching is (√5 + 1)/2, which is approximately 1.6180339887... It is IRRATIONAL and it has the name Phi. Here is a mathematical proof of what I just told you: The Ratio of neighbouring Fibonacci Numbers tends to Phi. If you solve this proportion for L, you get L = (√5 + 1)/2 · S or L ≈ 1.618S or L = Phi · S. The number Phi shows up here again! So if you divide a line so that the longer part is Phi times (about 1.62) the shorter part, you've divided it in the golden section (or golden cut). Even Euclid studied that in ancient times. He called it dividing the line in mean and extreme ratio. And the golden ratio is the ratio Phi:1. Solving the equation for the golden cut requires using the formula for quadratic equations, so it is a nice exercise for algebra students. 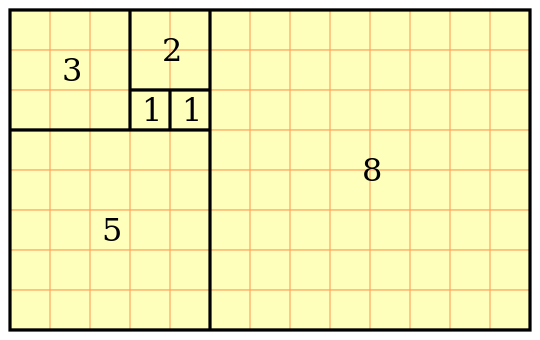 A golden rectangle is a rectangle where the length and the width of the rectangle are in the golden ratio. This means the length is approximately 1.62 times the width. Some people say this shape is an especially aesthetic rectangle, or that humans prefer golden rectangles over others. This hasn't been proven true so you can think what you want! I like that kind of rectangle okay. Next time when you are editing digital photos, try crop one in that ratio and see what you think. Check also this nice animated illustration of the golden rectangle and a spiral inside it. Let's consider something in the end. Should our children or students even learn about Fibonacci numbers or the golden ratio? It isn't any standard fare in math books. Studying Fibonacci numbers and how they appear in nature could be done in middle school. The golden ratio is an irrational number so it fits better high school math. Studying about the Fibonacci sequence and the golden ratio makes an excellent project for high school to write a report on. Then you're ready to study where all the golden section is found! The links below go to a fantastic website about Fibonacci numbers and the golden ratio – there is LOTS and LOTS more to learn. This list is just a suggestion of a few basic topics to include. P.S. Some people try to find the golden ratio in everything in universe and make it some sort of mystical thing or a "universal constant of design." It's true you can find it in nature but not every statement you find on the internet about Phi or Fibonacci numbers has been confirmed scientifically. See for example this scientific study proving just the opposite: The Fibonacci Sequence: Relationship to the Human Hand. The conclusion of the study is: The application of the Fibonacci sequence to the anatomy of the human hand, although previously accepted, is a relationship that is not supported mathematically.